The latest Perdix feature allows you to download a 320 (width) by 240 (height) picture. 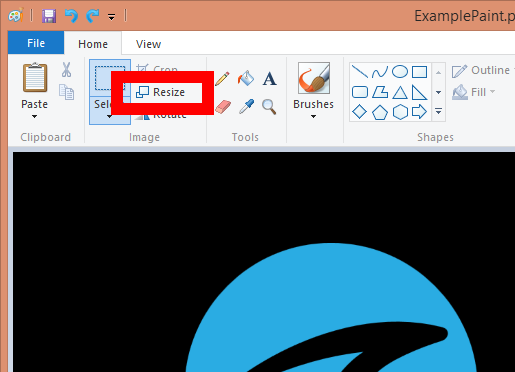 Since Shearwater Desktop is unable to resize the image internally, you must use an external program to resize your image to the appropriate size. Mac and Windows both come with a program that allows you to manipulate your image in such a way. This is a quick guide on how to use these tools to make your image fit on your Perdix. Follow the Computer specific instructions (Either: Mac or Windows) to resize your image. Once the image is resized and saved, follow the upload procedure section below. Search for: “Paint” in your start menu and open the application. We want to make the Image 320 x 240 pixels. So select the Pixels radio button at the top (As shown in the picture below). Uncheck “Maintain aspect ratio” and input 320 into the “Horizontal” box and 240 into the “Vertical” box. Verify the picture below to ensure you have the same information filled out. In preview, go to: Tools -> Adjust Size. In the menu bar. 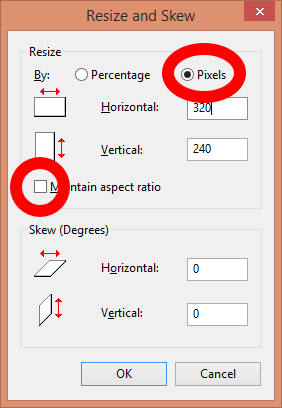 320 x 240 should be an option already in the “Fit into” pixels tab. Select that if you have the option. 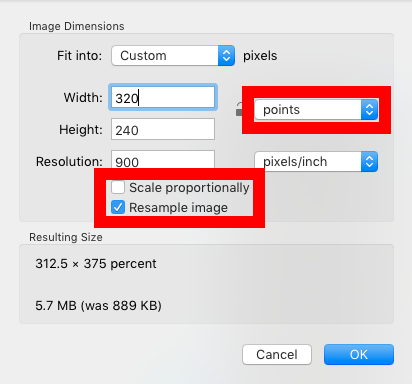 Otherwise select custom, uncheck the “Scales Proportionally” in the bottom, and then manually enter 320 for Width and 240 for height. You may need to change the Units to “Points”. Reference the right most Red box in the image below. Verify that your information looks similar to the picture below. Select :“OK”. Click: “Browse” and search for your newly formatted image from the steps above. 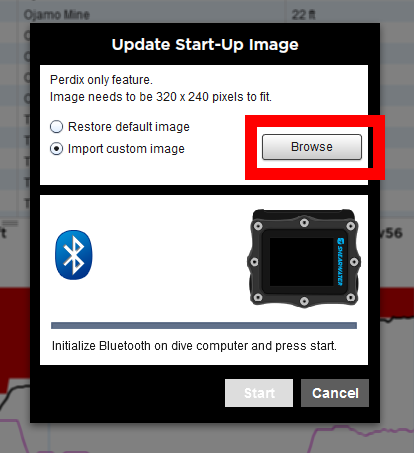 Now in Shearwater Desktop, click: “Start” in the Update Start-Up Image window. Your image upload should begin. If anything in this procedure confuses you, or if you run into any difficulties connecting, you can always talk to me at: support@shearwater.com. I am happy to help. I am the current developer responsible for Shearwater Desktop. It is my job to add features, fix bugs, and ensure compatibility with new products. In Shearwater Desktop, go to: Dive Computer -> Update Start-Up Image. Select the Restore default image option then connect your Perdix. This will give you the Shearwater Perdix logo. I will forge ahead and customise to my hearts content. Is it possible to do this on the Petrel 2 EXT? This feature is currently only available on the Perdix. Hi~ sorry for bothering you. I always got the “Error 175” whenever I try to upload the image or text to my perdix. It seems the blue tooth connection problem, my computer said I cannot find my Mac. But I can succefully to upload/ download all my dive log to my Mac. Could you please kindly to answer this question for me? Many thanks. It would be best for you to send us an email at our info@shearwater.com address. We will put you in touch with our tech support department and they will assist you. Hey Kip!! No way to put this feature on the predator. a?? This feature is currently only available on the Perdix. We cannot disclose our upcoming projects, but we always take customer feedback into consideration when making our product plans. Love the ability to put a custom message on the Perdix. Seems like a good place to have my DAN number and name. Great thinking. Keep up the good work. I have the Petrel 2 computer which I consider to be the best dive computer I have had. It is extremely easy to use in OC Rec, Tec, and CCR with outstanding graphics and easy to read information on the screen. My only gripe is that of the shearwater desktop program which although great will not allow users to enter a dive manually into program. So why would one want to do this? Well I had to send my shearwater back to the shop as I kept getting signs of condensation on the inside of screen. The computer was away for several weeks in which time I had completed around another 30 dives but I was not able to enter these dives manually in order to maintain the sequence in my dive log. I know it is possible to change the log number but it would be far better to enable the program to allow for manual insertion of a dive. Some time ago I owned a UWATEC dive computer and the Data Track program they provide allows the diver to manually insert a dive and enter all the dive details etc, the only thing you don’t get is the graph of dive profile. Please would you consider making this an adjustment to your program? Hello Steve, Sorry for the delay getting back to you. I want to thank you for your feedback. Being able to manually enter a dive log is a highly requested feature that we are definitely keeping our eyes on. At this time, our resources are all in developing Shearwater Cloud Desktop, one of the features we aim to add to this software is being able to manually enter the dive log. We are aiming to get the core functionality of the software working optimally first before adding in the new feature. also what is the file format the pic needs to be and what is the max file size? I apologize for the difficulty trying to download the start-up image in Shearwater Desktop. –	Ensure Shearwater Desktop is on the latest version (v3.1.4). –	Try downloading the start-up image in “Compatibility Mode”. (This can be toggled on under: Help -> Compatibility Mode in Shearwater Desktop). Compatibility Mode will increase the success rate but also make the process slower. Thank you for your feedback, Michel. Feedback like yours does make a difference in our decisions for new features. While we cannot promise to implement every suggestion, we do take them all into consideration. I second this, I want to display lost + found info, and it would be nice if it could have either a longer timeout, a configurable timeout, or a timeout with a button press that would escape to the home screen. +1 was this feature ever added? Lost/User information flashes incredibly fast during boot. Hi Jonathan. Not yet. We still have it on the list for consideration. It hasn’t been rejected. But we do not know if or when it might be implemented. I’ll add your feedback to our list. Thanks for taking the time to give it to us.